Newly-crowned Miss International Valerie Hernandez Matias, left, of Puerto Rico cries as the winner of Miss International 2013 Bea Rose Santiago, right, of the Philippines helps her queen gown during the final of Miss International Beauty Pageant in Tokyo. 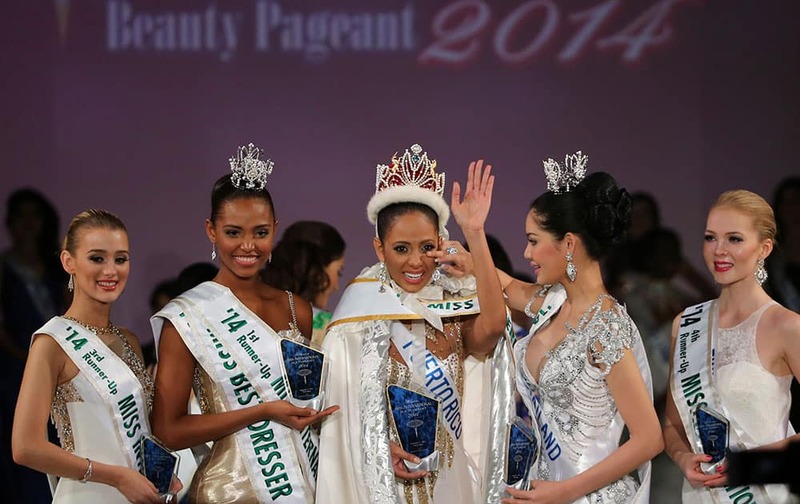 Newly-crowned Miss International Valerie Hernandez Matias, center, of Puerto Rico waves with her runners-up, from left, third runner-up Victoria Charlotte Tooby of Great Britain, first runner-up Zuleika Suarez of Colombia, second runner-up Punika Kulsoontornrut of Thailand and forth runner-up Milla Romppanen of Finland, after the final of Miss International Beauty Pageant in Tokyo. Miss Thailand Punika Kulsoontornrut poses in the swimsuit competition during the final of Miss International Beauty Pageant in Tokyo. Miss Puerto Rico Valerie Hernandez Matias poses in the swimsuit competition during the final of Miss International Beauty Pageant in Tokyo. Miss Colombia Zuleika Suarez poses in the swimsuit competition during the final of Miss International Beauty Pageant in Tokyo. Miss Puerto Rico Valerie Hernandez Matias poses in the costume competition during the final of Miss International Beauty Pageant in Tokyo. Miss India Jhataleka Malhotra displays the traditional consume during the Miss International Beauty Pageant in Tokyo. Miss Great Britain Victoria Charlotte Tooby competes during the final of Miss International Beauty Pageant in Tokyo.